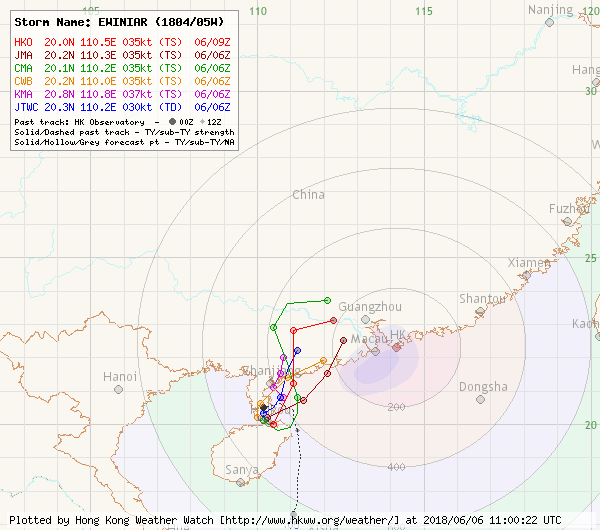 EWINIAR is the first system to necessitate tropical cyclone signals in Hong Kong this year. After a prolonged period of dominance of the subtropical ridge in May, convective activities developed in southern South China Sea in the beginning of June. The disturbance, numbered as 99W, strengthened into tropical depression 05W on June 2. 05W was situated in the western periphery of the subtropical ridge, and was expected to move north and approach Hainan. However, there was substantial disagreement among various numerical models on its future track. 05W remained as a weak system in the next two days as it suffered from moderate to strong southwesterly vertical wind shear. It failed to gather much clouds around its centre until June 5, when shear started to relax and convective bursts could be seen developing. It took another day before 05W's spiraling characteristics became prominent, prompting the JMA to upgrade it into tropical storm EWINIAR at 8 am June 6. EWINIAR was reaching the Leizhou Peninsula at that time, and a weakening in the steering flow caused the storm to decelerate once again. EWINIAR spent the day completing an anti-clockwise loop around Leizhou Peninsula and the Qiongzhou Strait, and made another landfall at northeastern Hainan at nighttime. Due to land interaction, EWINIAR's convections thinned but the core remained intact as could be seen on Hainan's radar images. The storm resumed its north to north-northeastward motion in the morning of June 7, and was able to intensify in northern South China Sea prior to landfall in coastal Guangdong. 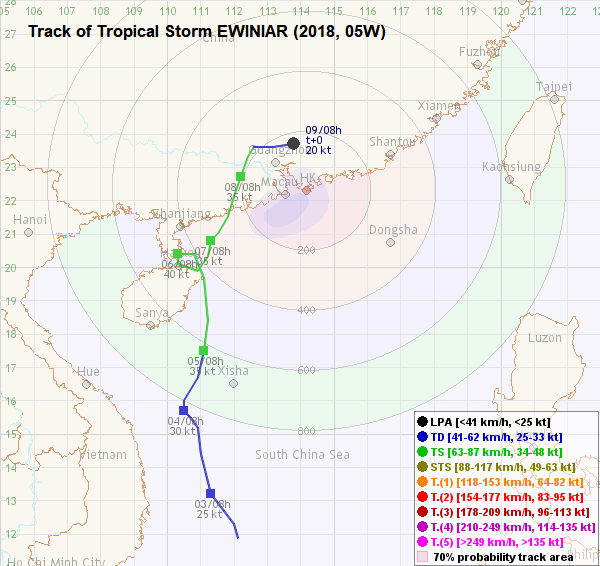 According to Chinese authorities, EWINIAR made its final landfall near Yangjiang, Guangdong at around 8:30 pm June 7, carrying winds of up to force 8. 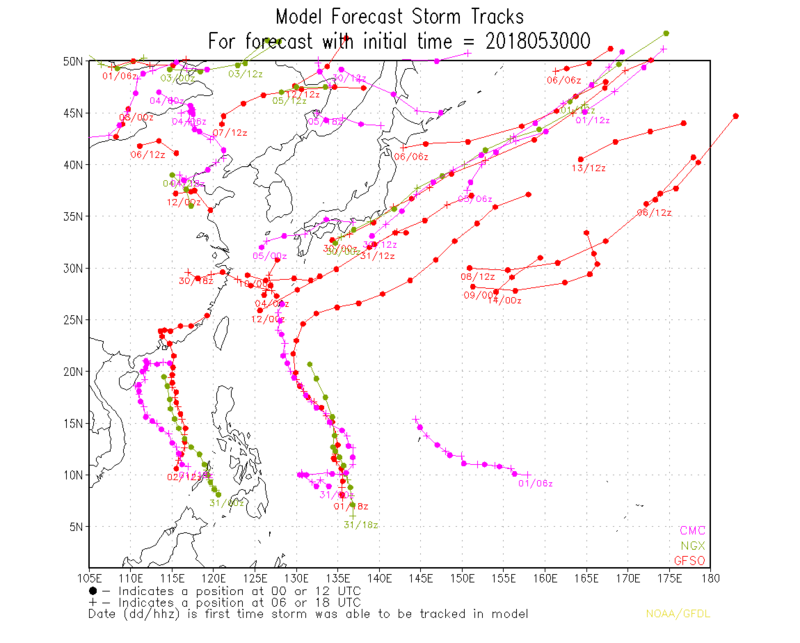 Some numerical models had previously predicted EWINIAR to turn east immediately after landfall, but this did not materialize as the storm continued to move north-northeast inland. 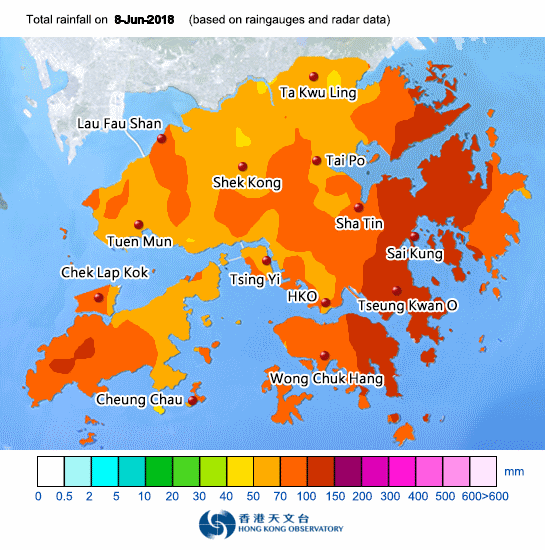 It weakened at a relatively slow pace due to the continued supply of moisture from the south, and was downgraded into a tropical storm by the HKO as late as in the afternoon of June 8. Because of the weakening ridge, EWINIAR stagnated again and turned east. 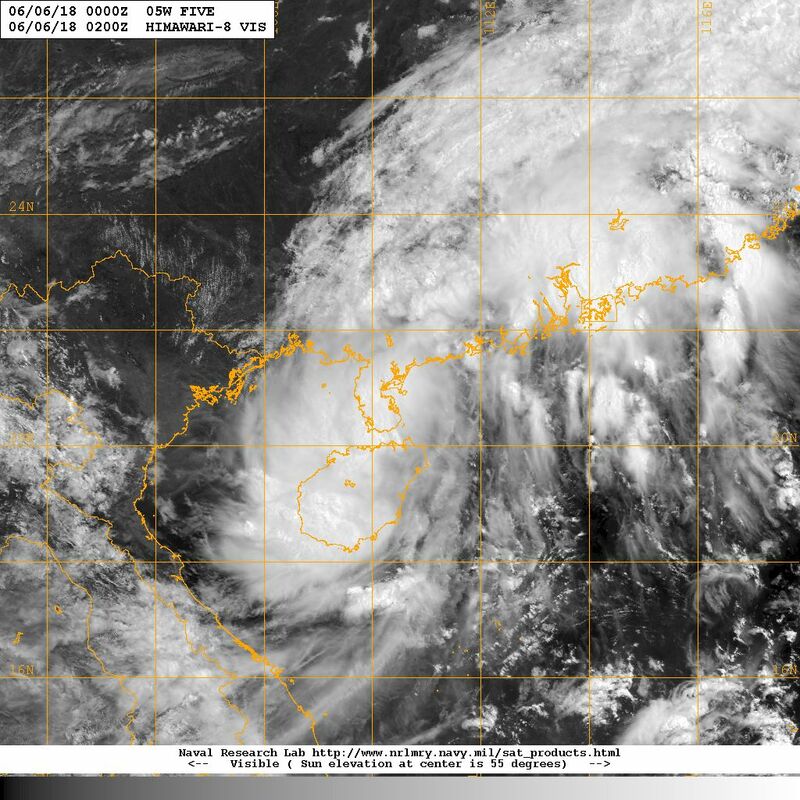 It weakened into an area of low pressure near Guangzhou in the morning of June 9*. It is worth noting that the JMA retained EWINIAR's tropical storm status until 8 am June 9, when it downgraded the system north of Hong Kong. 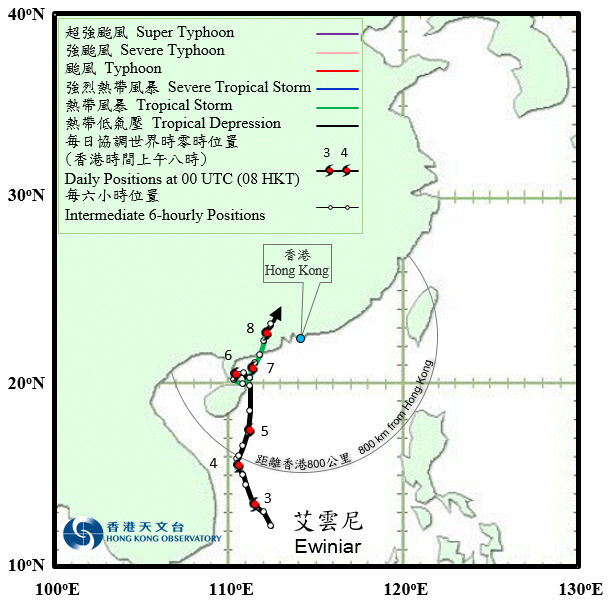 * In HKO's TC report, EWINIAR was described to have weakened into an area of low pressure by the night of June 8. 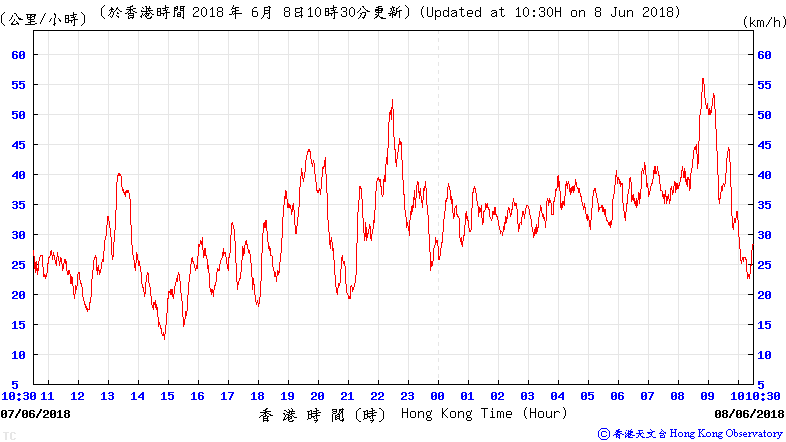 EWINIAR came to within 800 km of Hong Kong on June 4. 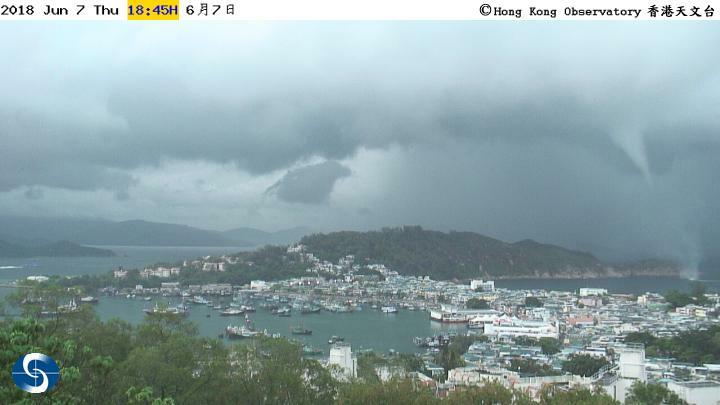 There were some scattered showers in Hong Kong on that day. 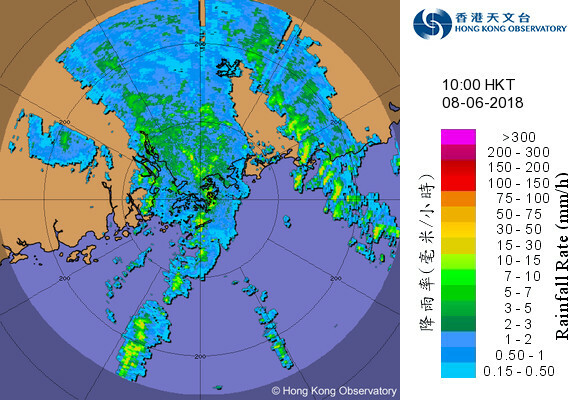 The HKO issued the #1 Standby Signal at 11:20 am on June 5 when the storm was around 600 km from the territory. A rare procedural error from the Observatory allowed the signal to be displayed on its website at 10:40 am, while its mobile application even dated back the announcement to 9:25 am. The weather turned unstable as induced convections associated with EWINIAR affected the territory, and 28.2 mm of rain was recorded at the Observatory on June 5. 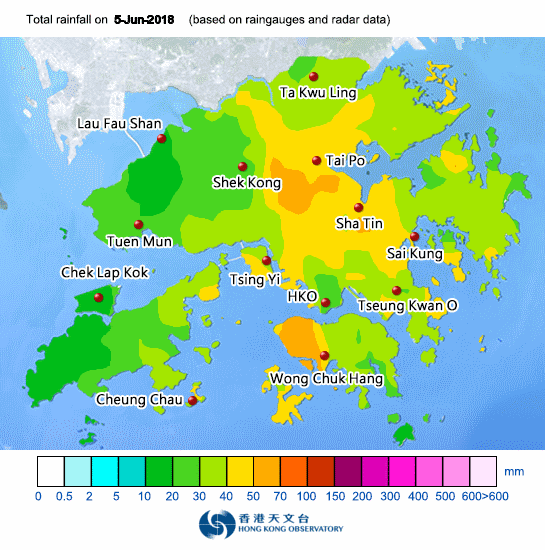 Heavy showers affected Hong Kong on June 6; the HKO maintained a low possibility for upgrading the signal that day and noted the erratic movement of the cyclone. 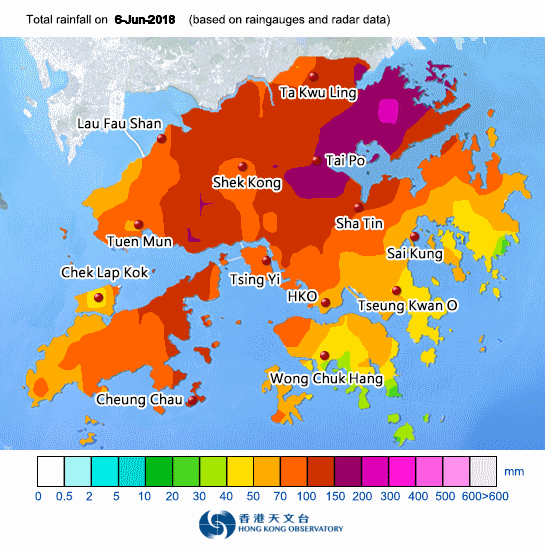 The first Amber Rainstorm Warning of the year and the Special Announcement on Flooding in the Northern New Territories were issued just after 1 pm, with the former lasting until 2:50 pm and the latter 6 pm. 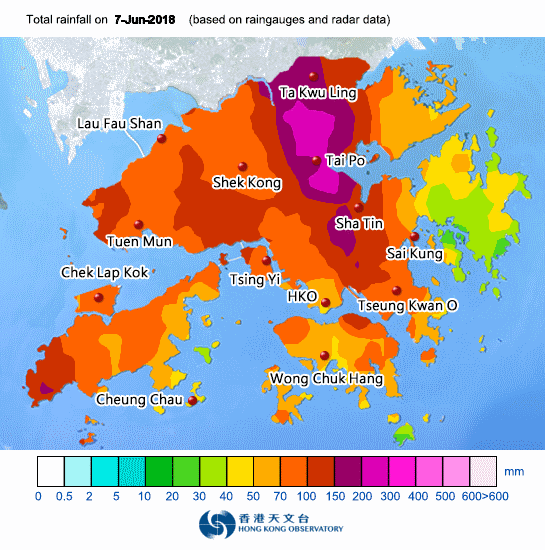 Northeastern Hong Kong received the most rainfall that day with areas such as Tai Po reaching 150 mm, while more than 50 mm of rain was recorded over most parts of the territory. 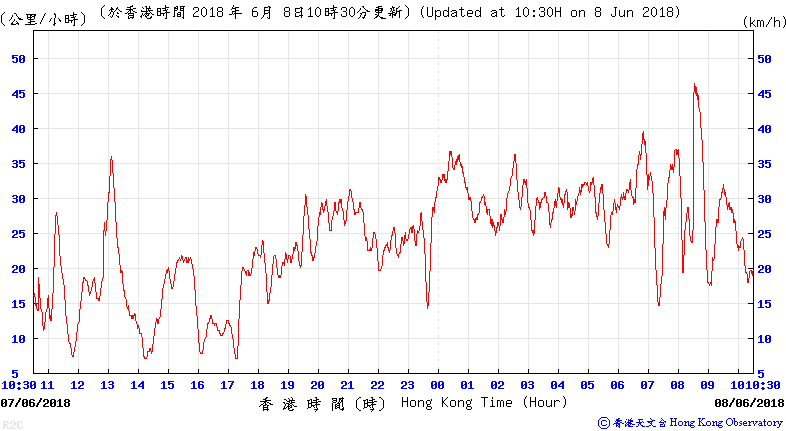 A surge in wind speed associated with the rainbands was observed later that night; strong force winds were blowing in offshore areas such as Cheung Chau, and on high grounds. Early on June 7, the Observatory mentioned that raising the signal before 10 am would be unlikely. However, as EWINIAR was approaching and had the potential to strengthen, the Observatory later indicated a possibility of issuing a higher signal by 2 pm. The Landslip Warning was issued in the morning due to the prolonged rainfall. 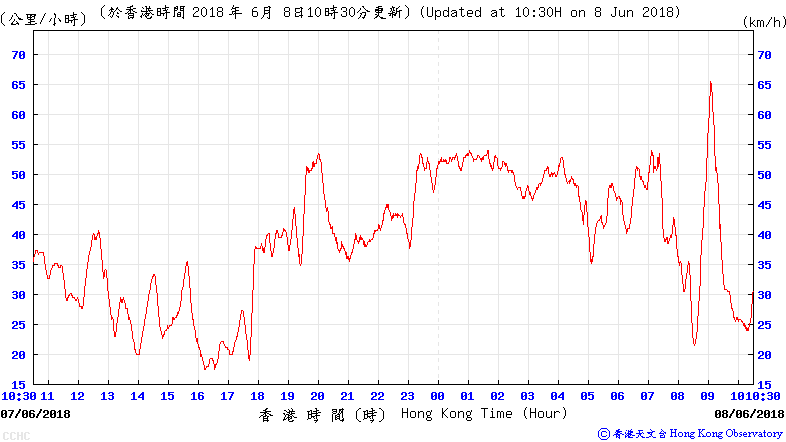 The #3 Strong Wind Signal was eventually issued at 12:40 pm when EWINIAR was at a distance of 330 km west-southwest of Hong Kong. Winds did not strengthen further following the issue of the signal, but strong winds were observed occasionally during the night. 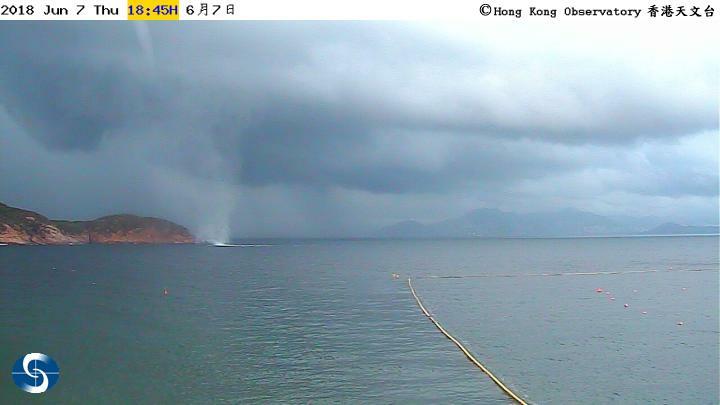 A waterspout was spotted in Cheung Chau towards dusk that day amidst the unstable weather. 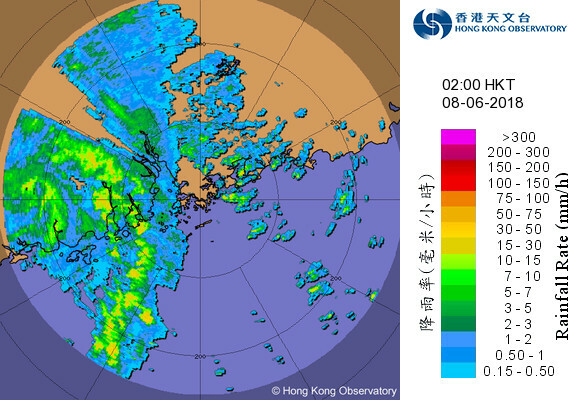 After EWINIAR's landfall, the rainbands associated with its core propagated eastward and reached Hong Kong in the small hours of June 8. 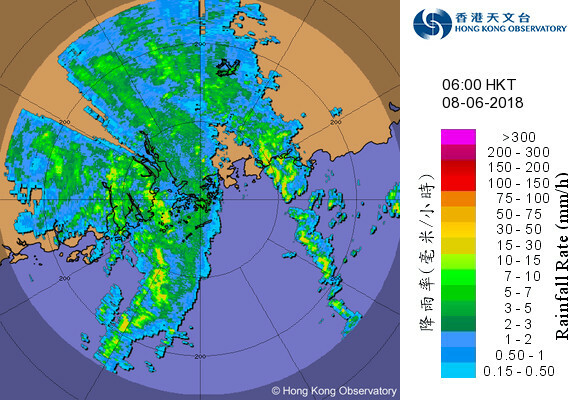 The Amber Rainstorm Warning was issued at 6:50 am; the rain was especially heavy between 8 and 9 am, but it was not until 11:30 am that the Observatory decided to raise the alert to the Red Rainstorm Warning, way after the peak of heaviest rainfall. This warning lasted only 1 hour and was replaced by the Amber warning, which was cancelled at 2:15 pm. As winds moderated in the afternoon, the #1 Standby Signal was issued at 3:40 pm to replace the #3 Signal. The #1 Signal was also cancelled at 6:20 pm. Following EWINIAR's degeneration, its rainbands also started to disintegrate and the Landslip Warning was cancelled at 3:50 pm. The weather improved gradually over the weekend. 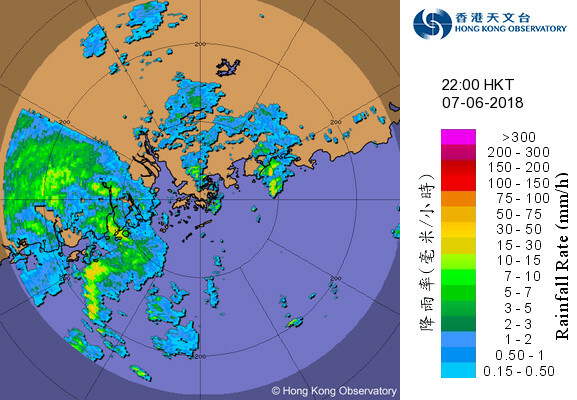 Between June 4 and June 9, a total rainfall of 221.3 mm was recorded at the HK Observatory. This brought an end to a period of extreme dryness in middle to late May.